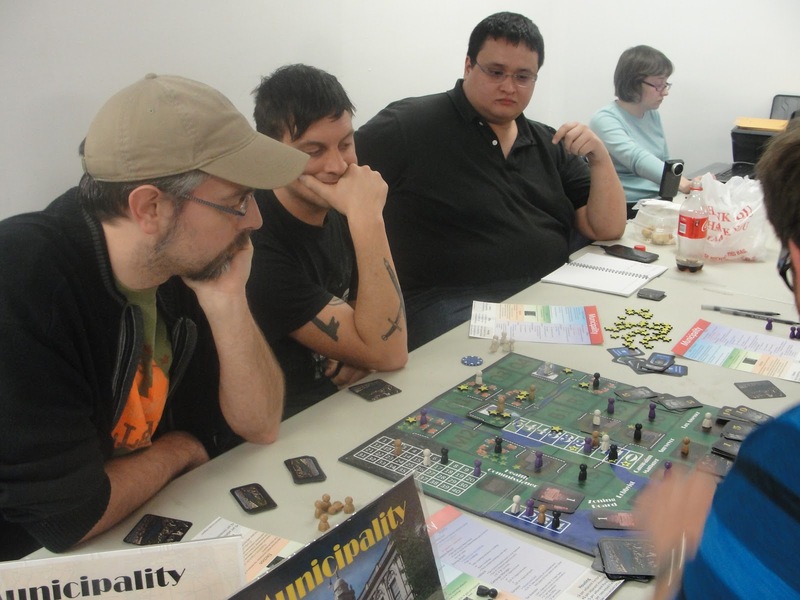 Fruitless Pursuits: Recap of the Mini Unpublished Games Festival in Philly! 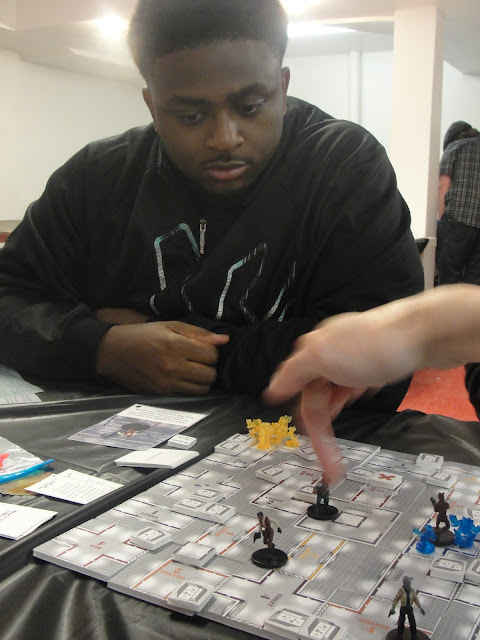 Recap of the Mini Unpublished Games Festival in Philly! 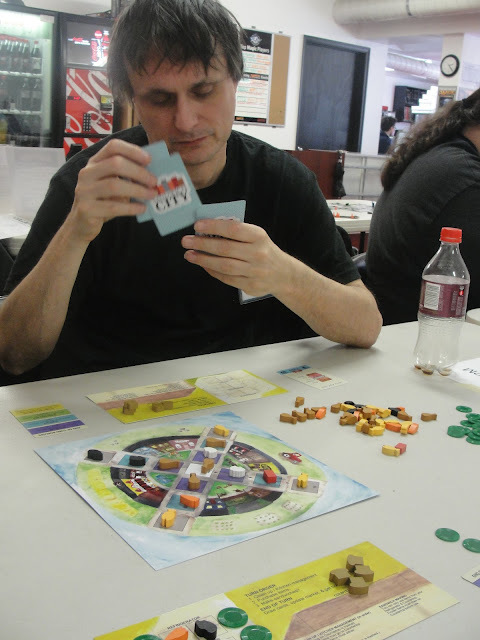 Last weekend at Redcap's Corner in Philadelphia, game designer John Moller hosted the first of his series of Unpub Mini events. 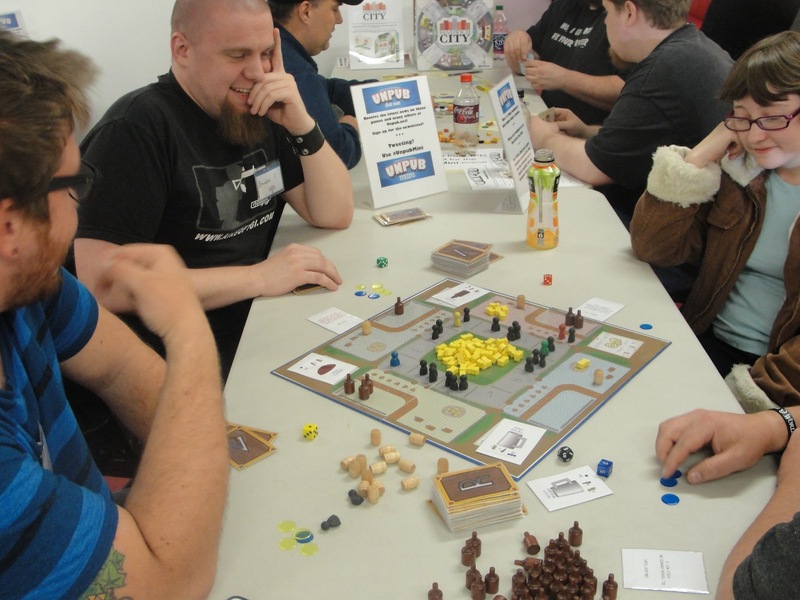 If you haven't heard of Unpub, it's short for Unpublished Games Festival, a showcase for tabletop game designers who would like to playtest, and showcase their unpublished games. More than that, it's a chance to get feedback from gamers as well as other designers in a controlled, exclusive environment. John runs a great event (with the great help of Katherine), and everything went off very smoothly. There were over 30 people playing games from 7 designers throughout the day. I had the chance to display my game Sandwich City, as well as the opportunity to play a few really cool new games. Check out the full recap after the break. When you present your own game, it's tough to get to play everything. Luckily I managed to sneak away from the table and get in a few sessions. I knew very little about this game going in, and I was able to jump into an intense 4-player game. And I really mean intense. It's a cooperative game, very much along the same lines of Pandemic or Forbidden Island, where the group works together to either complete the mission and win the game together, or everybody loses together (and in this game you can be eliminated, so it's possible to lose alone too). It's really tough.. in a good way though. We wound up winning on the final turn. We may have flubbed a rule or two enabling us to win as well, but it was all good fun. I never met anyone in my group before but in the game we were a serious team. We helped each other out, and had a great time doing so. I'm really looking forward to this, and hopefully playing it again soon. 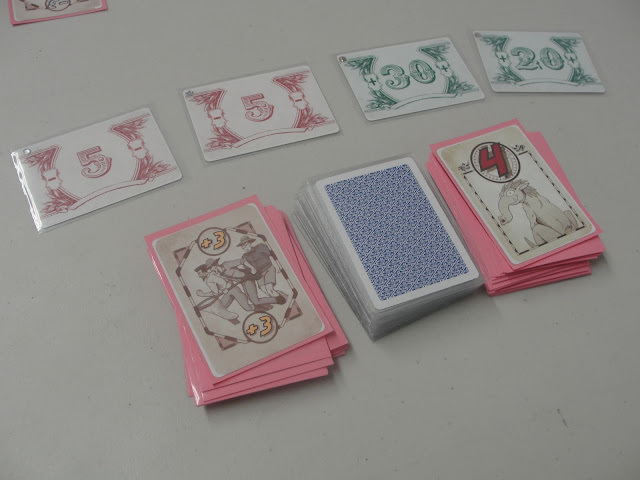 John describes Flummox as a "tug of war with cards". Each player draws, trades, discards and rearranges the cards in their hand (which is played face up in front of them, creating a bit of a track around the table). Then they'll play a card to move the Flummox piece around the table a certain # of spaces. If the Flummox lands on your space, you will get points from the 4 face up point cards. Some are positive, some are negative, but the decision is up to the active player. Hopefully you are the active player! Otherwise you might get stuck with a painful −25 point card. The game is very competitive, with trying to control the Flummox. Sometimes you'll want him in your area, and sometimes the only point cards available are all negative, so you'll want him as far away as possible. It's very interactive, as you can be effected during each turn of the game. This is still unpublished, but has been picked up by Clever Mojo Games. Looking forward to the release and getting to play this with my normal gaming group. I have a feeling it will go over really well. It's simple to learn, but can be very strategic as well. I've played Diamond Ninja twice before, and it's been great to watch the evolution of the game from a design discussion between me and Alex about jumping from building to building, to the newest prototype shown at Unpub. Diamond Ninja is a card laying game where players each control a ninja that is stealing diamonds in the city. 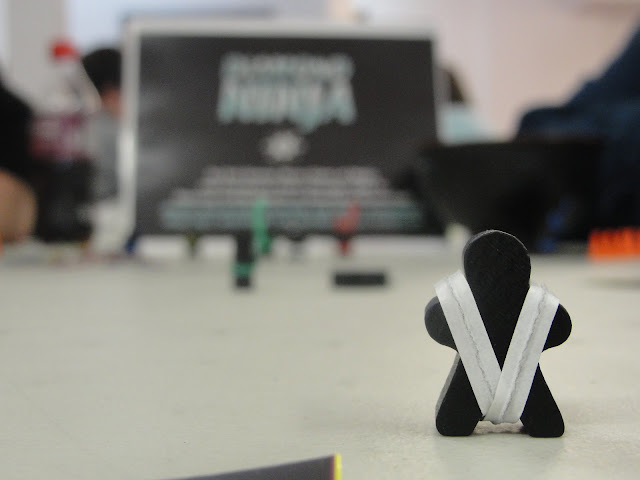 Before you start the game, you'll choose a black ninja meeple, and modify it with a twisty tie in your color. You can make a bandana, wrap it around the legs, arms, or in any way you can think of. Once you modify your ninja, you'll start to move around the board. 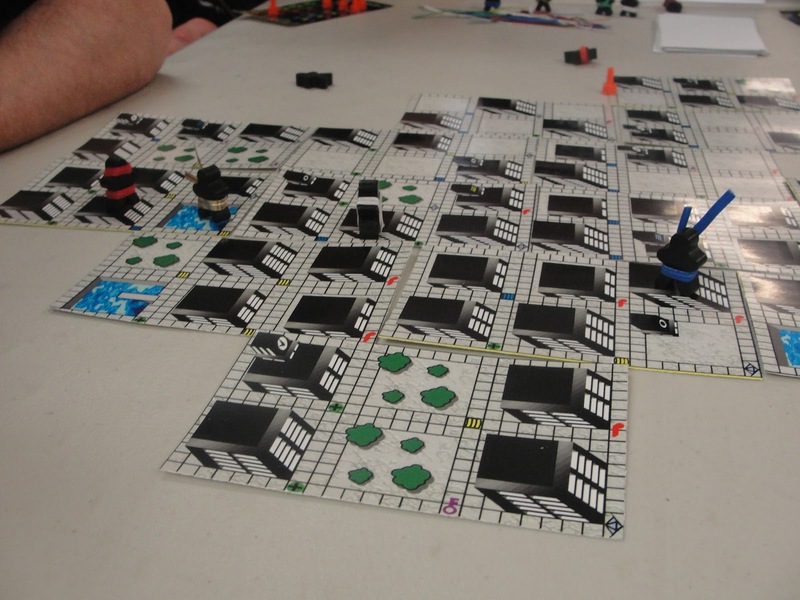 The board is created by placing cards, each of which feature rooftops in varying sizes. Movement is based on momentum. You will continue to move down from building to building as long as they are equal to or shorter than the building you are on. As soon as you go up to a higher building, you stop and get your reward for the turn. Based on the height that you advanced, the reward may be a diamond, gold or silver (which you can upgrade later) or something bad like a police siren. Also, for each level of building that you go down during your turn, you lose a health point. It's a super creative game, and I've enjoyed all of the play tests so far. I hope to see this one keep going! I didn't get a chance to play Traitor Tavern, but that's okay because I had a light role in the creation of the game. My brother George designed it with Brandon Kavistky and I helped out in the early stages. It's a "pub brawler" where players each control a tavern. They must buy resources to create specific beers, and earn money by serving their customers. They also each control a traitor that they will send into other taverns to drink up their beer and not pay, or force their customers out, etc… There are many different traitors to randomly choose from at the start of the game, so each game is different. This game got a lot of play at Unpub, and lots of laughs. The sessions went well, and I received great feedback from everyone who played. 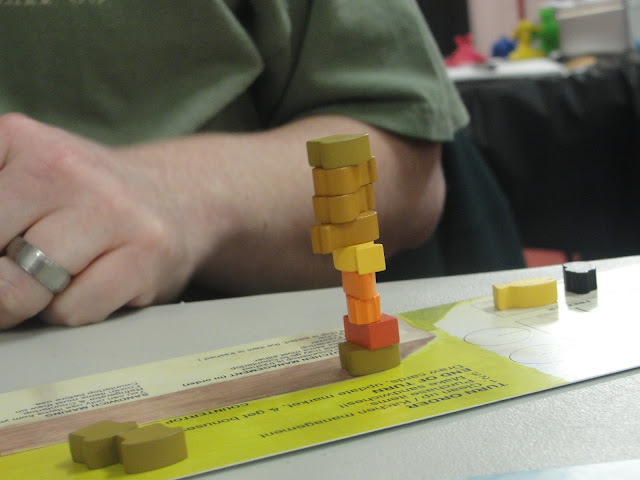 The Unpub events are really helpful as everyone is genuinely interested in playing the games, and very open to talk about what they like and dislike. This was the only other game that I didn't get a chance to play. It was packed all day, and at one point a seat opened up, and I was too slow to get over to it before someone jumped in. My brother played and I overheard him saying how much he enjoyed it. There are many more small local Unpub events coming up. There are events scheduled in PA, DE, DC and more branching out across the country. They are free and a great time for designers as well as anyone who is interested in playing some fresh, new, unpublished games. Check out http://www.unpub.net for all of the details. Although I'm not part of this scene, I find it absolutely fascinating as an outsider. Lot of cool looking stuff there. It's an amazing idea for an event. My favourite innovation here is getting to customise your ninja with the bandanna. Such a small thing which adds a lot of character and attachment to your piece. Really smart stuff. The ninja customization is classic Alex Strang design. He's a good friend, and I love tossing ideas around with him, because he is full of crazy awesome solutions to problems. Not just with gaming, with any type of project.